Jazz saxophonist Roger Hanschel studied at the Musikhochschule Köln in Germany and School for Fine Arts in Banff, Canada. He founded the group Nana in 1983. His works have appeared in 23 CDs and he has toured extensively at jazz festivals around the world. Since 1987, he has been a member of the group Cologne Saxophone Mafia, which won a number of awards. Hanschel also founded the trio Triosphere, quarter Heavy Rotation, and a duo with the singer Gabriele Hasler, and has teamed with Dutch cellist Ernst Reijseger as well. His most recent collaboration is with Indian musicians Deobrat Mishra on sitar and Prashant Mishra on tabla. Their group, Trio Benares, performed in Bangalore recently at the Windmill Craftworks jazz pub. I caught up with Roger Hanschel after his performance for this exclusive interview on jazz and fusion. How did Trio Benares get formed? RH: I have felt deep love for Indian classical music since a long time, because I am a fan of shehnai legend Ustad Bismillah Khan since the early 80s. But after all those years I was dis-satisfied because of my limited knowledge of this music. So, I decided to spend some time there in India where Bismillah Khan lived and take some lessons. 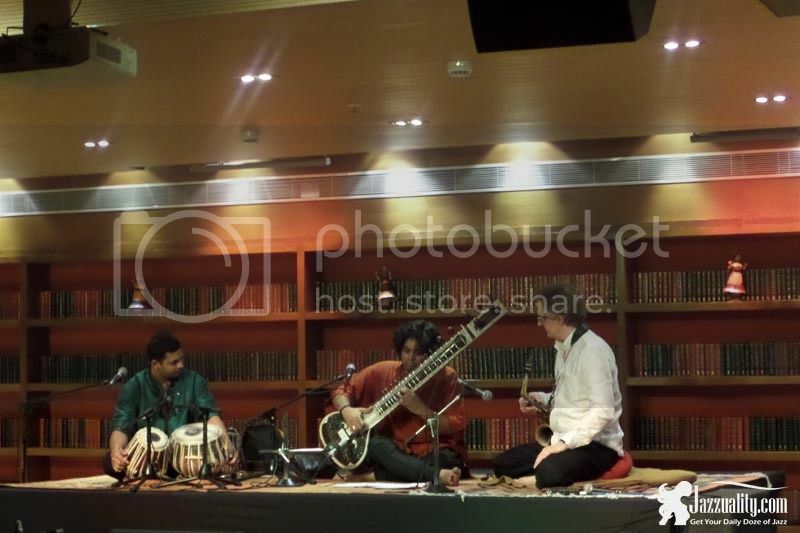 In summer 2013, I was visiting the Mishra musicians – Deobrat on sitar and Prashant on tabla. It was clear that this would not be a regular teacher/student relationship but more a ‘colleague-ship.’ So after playing a little together in Varanasi we had a concert in Cologne in September 2014. That was when we decided to form Trio Benares. What made you interested in music in your early years? RH: My mother was singing in a choir and my sister, who is four years older than me, is a violin player and was of course inspiring me in early years. I started playing recorder at the age of eight, and at the age of eleven I was listening to a concert where there was a saxophone player. I fell immediately in love with that instrument and never stopped playing it since then! RH: The challenge is to express my emotions through music and the way to get to this goal. I always want to find the emotional center in myself and make this portable through music. Who would you say are the leading musical influences in your career? RH: John Coltrane, Bismillah Khan, J.S. Bach, Jan Garbarek, Hariprasad Chaurasia. How are you able to blend such different musical genres so effectively, i.e. create ‘fusion without confusion’? RH: It is all about avoiding copies of any styles and to find the true voice of yourself. It’s about finding the real unique sound of this trio. We do not put fixed styles together. We try to be open minded and put influences of the colleagues into their own ways of playing. We are all leaving known paths and approach unknown areas without losing their own expression. How would you describe your musical journey? RH: In the beginning of my career, I was playing and composing much more experimental, searching for new possibilities which were not there before. The older I become, the more experienced I become with the ability of getting to the point of concern, which is searching for the real Roger. Who am I, and what is my center of being which has to come out through my music? For this aim I am now much more able to design my music, to know exactly what I want to express. What is your vision of what music can do in this day and age. RH: Music can move people emotionally. This is a big power I think. It can be stronger then every political statement. RH: I am now working on the recordings we made with Trio Benares. The CD-recording has to be edited and mixed and will be released hopefully soon. There are also some videos we made of our concerts we played in India last month I have to work on. Besides Trio Benares, I am working on a pre-production CD for a septet. I was writing music based on poems of Christina Rossetti. What have been your previous highlights in playing across India? RH: In 1994, we played a four-week tour through India and Pakistan with the saxophone quintet, the Kölner Saxophone Mafia. That tour was very important to me. After being a fan of Bismillah Khan for many years, it was a little like coming home. RH: Basically I am never composing on tour. At the most I make some notes to not forget ideas. Composing is for luxury of time and I want to have a good time while composing. No stress, good tea, silence! Do you also teach workshops? RH: Yes, I am teaching one day a week at the Musikhochschule in Köln. I am educating future professional musicians there. They can sign up for bachelor or master’s degrees with me. How has the music industry changed over the years, and how has that affected your work? RH: Producing CDs is not as important anymore as it was 10 or 15 years ago. Downloading or copying illegal is taking place more and more. The music industry is looking for money, not for art above all. This can compromise art. So, especially for young artists, it is important to decide how far they go away from their art towards a career for making money. What message would you like to convey through your music? RH: Take your time, drink tea and listen to music!